Broadcast Music Incorporated (BMI) gave special recognition to singer/songwriter Tiff Joy as Amazing, her composition recorded by Ricky Dillard’s New Generation Chorale took top honors as the Most Performed Gospel Song of 2015 at the 17th annual BMI Trailblazers of Gospel Music. Amazing, which was nominated for a Grammy spent some 30 weeks in the top spot on the Billboard chart and received a Stellar Award for Song of the Year. 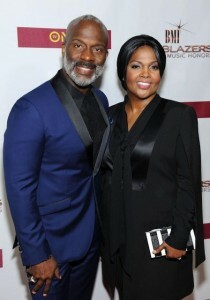 Gospel Music Mega Stars Bebe and Cece Winans and Mary Mary were honored in Atlanta at the 2016 BMI Trailblazers of Gospel Music Awards. This iconic invitation only event was the talk of the town as it was a night filled with inspirational music, well blended duets, and show stopping surprises. This year BMI wants you to have the best seat in the house. The special is set to air February 19th at 8pm EXCLUSIVELY on TVone. The event was hosted by previous BMI Trailblazer Award winner , Yolanda Adams. 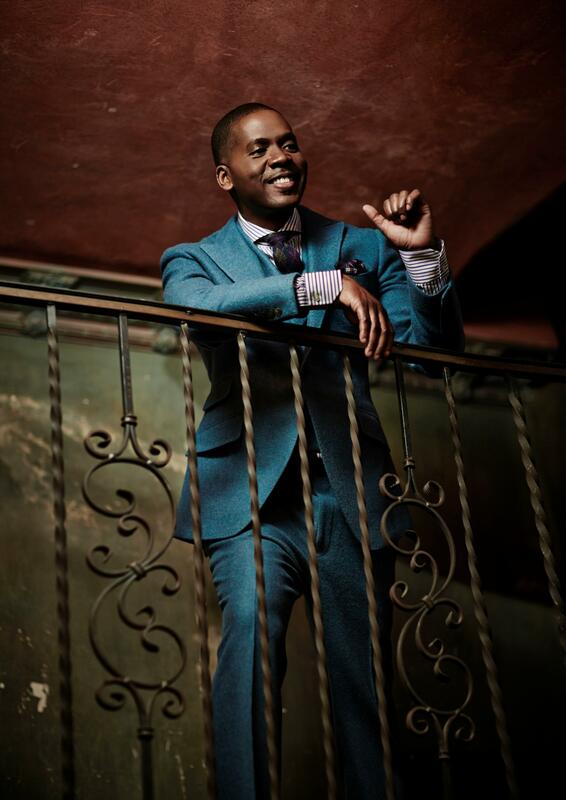 In addition, Ricky Dillard & New G and Tiff Joy were honored with “BMI’s Most Performed Gospel Song Of The Year” Award for their hit single, “Amazing”. 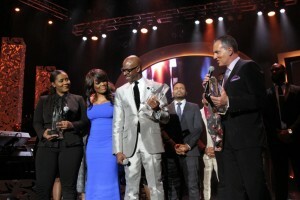 BMI also recognized the Ten Most Performed Songs of the Year (2015): “But God,” co-written by Isaac Carree, Philip Cornish and Eric Dawkins and performed by Carree featuring James Fortune; “Different,” written by Kirk Franklin and performed by Tasha Page-Lockhart; “Help,” co-written by Hasben Jones and Harold Lilly and performed by Erica Campbell featuring Lecrae; “I Can Only Imagine,” co-written by Israel Houghton and Meleasa Houghton and performed by Tamela Mann; “I Will Trust,” co-written by Phillip Feaster, Calvin Rodgers, and Fred Hammond, who is the performer; “No Greater Love,” written by Aaron Lindsey and performed by Smokie Norful; “This Place,” written by Darrell Blair and performed by Tamela Mann; “War,” written and performed by Charles Jenkins; “We Are Victorious,” written and performed by Donnie McClurkin featuring Tye Tribbett; and “You Alone,” written by Michael McDowell and performed by the Arkansas Gospel Mass Choir. Get ready for performances by Tamela Mann, Donald Lawrence, Kierra Sheard, Kelly Price, Avery Sunshine, Tamia, Deborah Cox, KeKe Wyatt, Tasha Page Lockart, Lisa Page Brooks, Tasha Cobbs, and more! 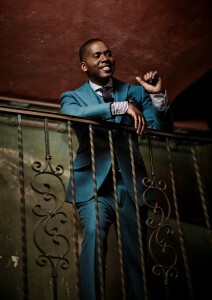 The BMI Trailblazers airs February 19th at 8pm on TVOne. Check Out The Link To Our Online Gallery! The BMI Trailblazers of Gospel Music Awards have announced it’s honorees for the year and it will no doubt put a premium on what is already one of the most sought after tickets of the year. 2016 marks the year that BMI will celebrate the contributions of two of gospel’s most prolific duos – Bebe and Cece Winans and Mary Mary. The event will take place on Saturday, January 16, 2016 at Atlanta’s Rialto Center for the Arts. This is the second year the event has taken place separate from it’s longstanding annual date during Stellar Award weekend. Headed up by BMI’s Catherine Brewton (Vice President, Writer/Publisher Relations) the Trailblazers of Gospel Music Awards will host gospel music’s premier songwriters, recording artists and music industry executives, as well as the genre’s legends. 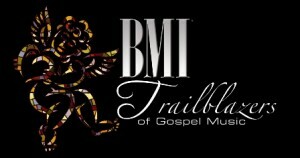 BMI will also announce the Most Performed Gospel Song of the Year at the ceremony. 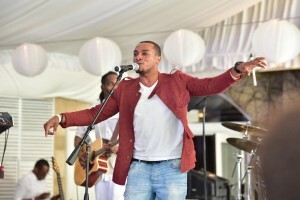 Jonathan McReynolds performs at BMI’s Gospel on the Park Brunch, held on June 7 at Park Tavern in Atlanta. In celebration of Black Music Month, Broadcast Music Incorporated (BMI) has added another event to their roster of signature events that celebrates the music that we know and love. 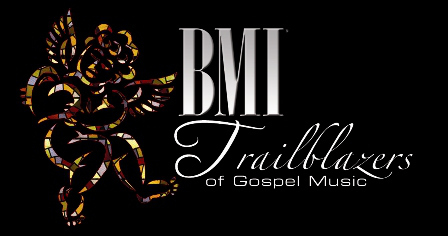 For the past few years BMI has been instrumental in honoring Gospel Greats through their iconic Trailblazers of Gospel Luncheon and Award Show. Now visionary, Catherine Brewton, who serves as Vice President Writer/ Public Relations and team have now gone a step further by creating the 1st Annual Gospel Brunch On The Park. When asked about how the event came about Brewton says that it was an idea that came to her and that her awesome team pulled it together so quickly. 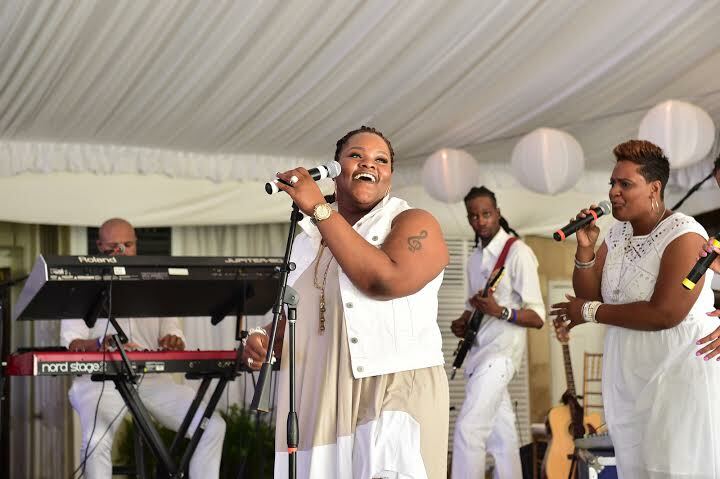 Passionate about the art of Gospel Music, Catherine says that even though her role at BMI allows her to cross genres with some of the biggest names in music. Gospel is near and dear to her heart. 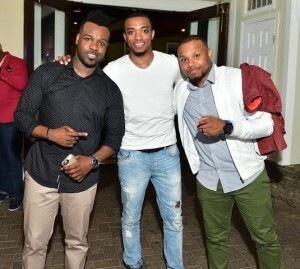 VaShawn Mitchell, Jonathan McReynolds and Todd Dulaney at BMI’s Gospel on the Park Brunch, held on June 7 at Park Tavern in Atlanta. In an intimate venue in the heart of Atlanta, Gospel music fans gathered on a beautiful Sunday afternoon for an elegant brunch and time of worship. Set the hit the stage were Grammy Award Winning Artist Tasha Cobbs, Grammy Nominated artist VaShawn Mitchell, and two fresh and unique voices in gospel music Jonathan McReynolds and Todd Dulaney. The atmosphere in the room was serene and peaceful and people from all over gathered to celebrate Gospel during a historic month. To show support for new and upcoming artist BMI chose to hold a contest through Instagram where singers and musicians were able to submit their version of a song by one of the artist set to perform. After hundreds of submissions two artist were selected. A group of young people by the name of “Grace” sang their rendition of the James Cleveland classic, “God Is”, and mixed it with the traditional hymn, ” I Surrender All”. A true moment of worship took over the place when Curtis Eubanks from Milwaukee took the stage singing CeCe Winans’, “Jesus You’re Beautiful”. Curtis into set the tone for the rest of the afternoon. 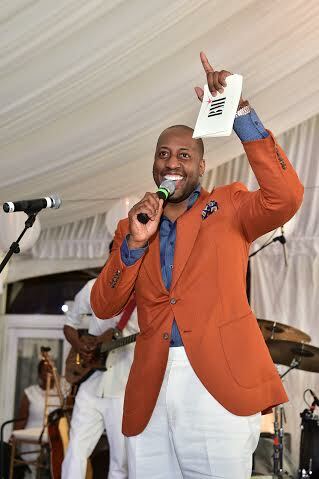 Isaac Carree onstage at BMI’s Gospel on the Park Brunch, held on June 7 at Park Tavern in Atlanta. Hosts Isaac Caree and Catherine Brewton didn’t have much to do as their was a strong wind of power in the room. One by one Todd Dulaney, Jonathan McReynolds, VaShawn Mitchell, and Tasha Cobbs turned a simple restaurant at a local park into a cathedral of worship. Songs such as “Nobody Greater”, “Turning Around For Me”, “Free”, and “Fill Me Up” were declared as hundreds of worshippers stood weeping, dancing, and receiving. Throughout the course of the afternoon attendees were reminded of the fact that Gospel music needs the support of its fans around the world. With the music industry constantly changing and CD Sales declining if we want to keep the music we love around we have to show up in big numbers. Tasha Cobbs performs at BMI’s Gospel on the Park Brunch, held on June 7 at Park Tavern in Atlanta. Each of the artist who performed represented the new generation of Gospel destined to continue to the long rich tradition of the genre. 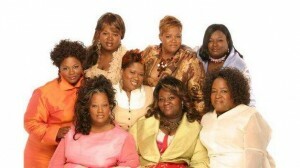 With all of them having new singles and albums on the way, Gospel music fans have some great material on the way. BMI plans to hold this event in other cities annually to keep the tradition going. Atlanta, GA was on fire as Gospel music’s biggest and brightest stars, producers, and industry personalities invaded the city for The 16th Annual BMI Trailblazers of Gospel Music Awards. BMI Vice President Catherine Brewton described the event as a “homecoming”. Sixteen years ago the first BMI Trailblazers Event was held in Atlanta with just a keyboard, drum set, and a hundred people. Since its humble beginnings the event has gone on to be considered the Gospel equivalent of the annual Clive Davis Grammy Party. In past years the event was apart of Stellar Award Weekend, but when it was decided that The Stellar Awards would be held in Las Vegas, BMI decided to return “home” to its Atlanta beginnings. This weekend’s BMI Trailblazer Awards were also the scene to honor Gospel’s Most-Performed Song of the Year: “The Gift,” written and performed by Donald Lawrence. 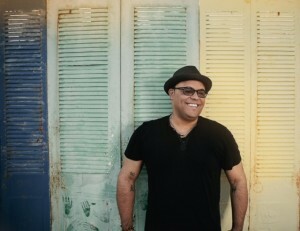 The song, featured on Lawrence’s album Best For Last, topped the Billboard Gospel Airplay chart and achieved wide-spread success. BMI also recognized five additional opuses as Top-Performed Gospel Songs of the Year (2014): “1 On 1,” written by Lucius B. Hoskins and performed by Zacardi Cortez; “Clean This House,” co-written by Philip Cornish and Isaac Carree, who is the performer; “God Will Make a Way,” written by Ay’Ron Lewis and performed by Shirley Caesar; “Here in Our Praise,” co-written by Michael Bethany and Fred Hammond, who is the performer; and “It’s Working,” co-written by Aaron Lindsey and William Murphy, who is the performer. 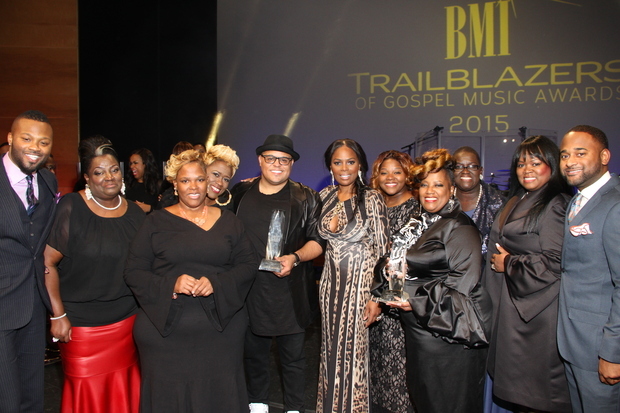 This past weekend, BMI brought legends and contemporary stars together to celebrate the careers of gospel giants Israel Houghton, LaShun Pace and The Anointed Pace Sisters at its 16th annual Trailblazers of Gospel Music Awards in Atlanta. 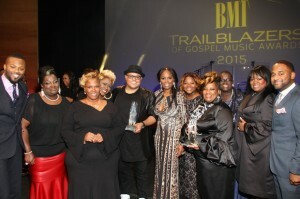 BMI announced that their Annual Trailblazers of Gospel Awards event will be held on January 17, 2015 at the Rialto Center For The Arts in Atlanta, Georgia. The Trailblazers of Gospel Awards event was a part of Stellar Awards weekend for many years, but opted for a new venue and city as the Stellar Awards moves to Las Vegas in March. You are currently browsing the archives for the BMI category.